Hey there. I am a Laker fan. Always have and always will. Tonight, the new kids on the block, the Oklahoma City Thunder, have just given the Lakers a beat down in game 1 of the Western Conference Semis. Yup... A 30 pt beatdown! Technically, it's 29 but still, the Lakers should be embarrassed of themselves. Aside from a respectable 1st qtr, the Lakers were not prepared to play. Here are some thoughts on the series and on game 1. If they Lakers were to lay an egg, and I'm glad it was in game 1. The for whatever reason, the Lakers seem to self implode whenever they are down in a series. The NBA Finals loss to the Celtics was embarrassing, last year's playoff exit had Andrew Bynum being ejected, and there are other instances where the Lakers just didn't bother to show up. And it's always at the end of the series. If the Lakers find themselves down this series, I don't see them clawing their way back into it. 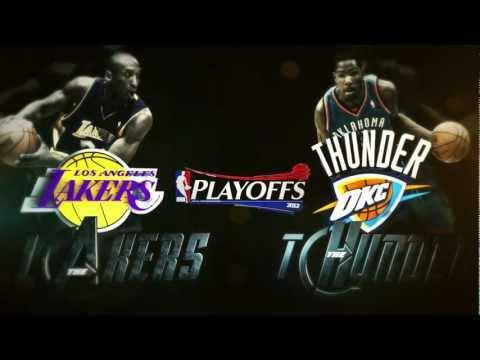 Not to pile on excuses, but the Lakers had no rest in between series while the Thunder have had 9 days to sit, wait, and prepare for their opponent. That is the Lakers fault. They should have put away the Nuggets when they had the chance instead of screwing around and having that series extend to the maximum 7 games. Let's face it, Kobe is aging. He's still the Black Mamba when he needs to be but he can't do it all the time and especially on tired legs. The whole team just seemed spent tonight. Kevin Durant had that jumper from the elbow all night long and he hit them consistently. Russell Westbrook sliced his way to the rim time and time again. 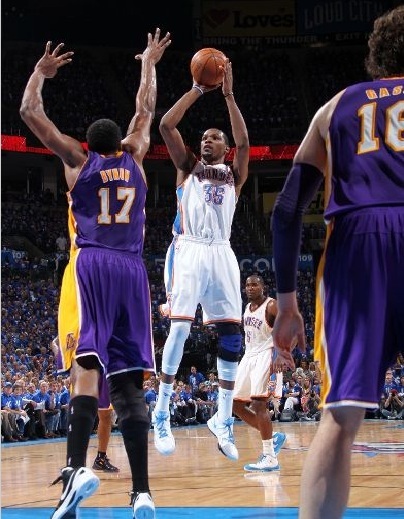 The 3rd qtr saw nothing but jumper and jumper go in for the Thunder. The Lakers defense was non existent and pathetic. The Thunder simply had their way with this Laker team! 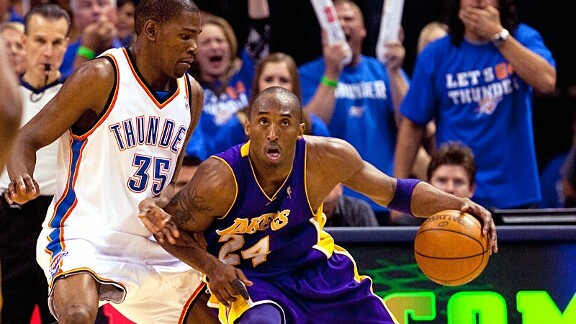 Aside from the Metta World Peace and James Harden plotline, there is Kevin Durant needing to prove himself. I like the kid. I love the commercials that he's in. The kid is great and I do not doubt that he will one day be a champion. I just do not want to see it happen at the Lakers expense. Throughout the game, he hit that open jumper at the free throw line, he hit open team mates for the assists, and he hit 3s. The kid is good. The kid is hungry. He's going to bring his A game each and every time and if the Lakers do not come ready to play, he will make them pay. And where the hell was the Lakers bench? Barnes? Blake? Hill? This is where losing Lamar Odom hurts the most. His long body would create matchup problems for the opposing team and even though his offense wasn't always on, his facilitating skills and ability to play 4 of the 5 positions made him a huge asset when a starter needed a few minutes to catch their breath. The Lakers need to get their act together. Almost every TV analyst has the Thunder winning this series in 6. If the Lakers lay another egg like they did tonight, they won't make it to see a game 6. Later!